This July, three of New Zealand's finest folk acts will join forces for a hearty live experience - their energy combined is enough to power a small village! Albi & The Wolves are the most recent recipients of the 2018 Tui for Best Folk Artist for their stunning debut album One Eye Open, which captures the Auckland trio's captivating blend of folk with modern sensibilities of neighbouring genres and styles. 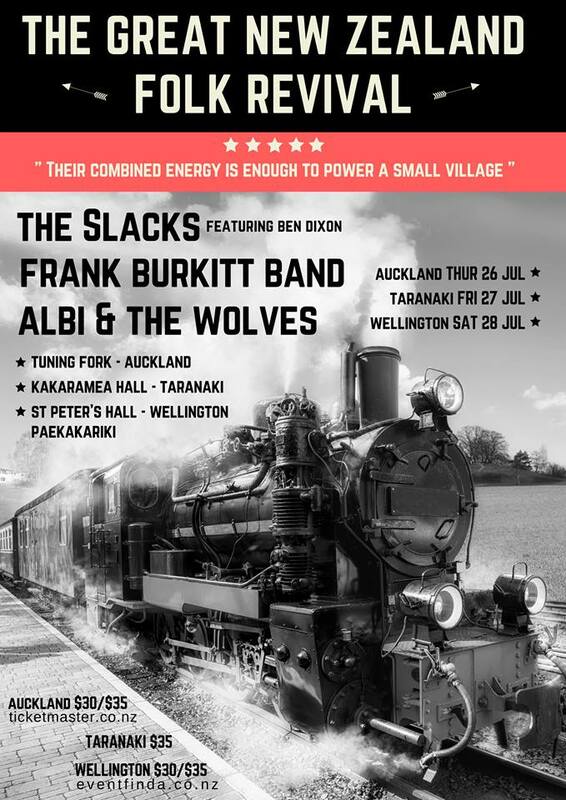 From Wellington via Scotland, The Frank Burkitt Band are no strangers to tour van life, having recently played Port Fairy Folk Festival in Australia off the back of their new album Raconteur. Taranaki's own theSlacks with be joined by fellow Taranaki musician Ben Dixon, spreading their hearty, good vibes and highly singable tunes to audiences both young and young at heart - with a bit of Kiwiana for good measure. Be sure to catch this big, fun-loving musical family when they hit a town near you. For more details and tickets head to Eventfinda.